The act of lounging is more than simply having a horse run in circles on the end of a long line. It differs from the round pen reasoning training, a form of free lounging, which has gained in popularity over the last decade. Lounging (aka Lunging) is a skill that is applied in teaching the horse many avenues of communication. It combines the horse’s keenest natural sense, that of hearing through voice, as well as utilizing body language to engage position and pace of gait. Done correctly, lounging promotes discipline of the horse, balance and cadence. It is one of the most basic tools available in starting a young horse or re-schooling a difficult or damaged horse. In all forms of training, safety should be considered. Rope burns from a line that travels through the bare hand at tremendous speed, can inflict searing pain while blistering the skin. Wearing protective gloves can eliminate this hazard and provide greater grip on the line for improved control. In all groundwork involving horses, safety boots and protective headgear are recommended for the trainer. Taking care in handling your equipment and being alert when training is essential. Complacency results in accidents. More incidents happen off the horse than in the saddle. Preventing injury is the essence of good training practices. Although a fine stitched leather caveson or an enclosed round pen are excellent choices, they are not necessary. You can lounge successfully on a budget. Shopping for equipment is not difficult or expensive. There are a wide variety of lounge whips and lounge lines available to consumers. Preference might be towards a soft cotton line over light nylon. The weight and texture of the line will give the trainer a better feel and balance. Handle the lounge whips before paying the ticket price. Does the stock feel balanced in your hand? Can you endure holding the weight of that whip for lengthy periods of time, or should you choose one of a lighter construction? Is the lash too long and cumbersome? These are questions you will have to ask yourself in order to choose the appropriate product that accommodates your personal preference. Take care to adequately protect your student from injury and tendon stress. Apply protective leg wraps and boots when working on the line. A horse won’t naturally walk a circle. Circles must be taught. Begin by leading the horse in a circle. With each revolution, increase the distance between you and the horse until the horse will comfortably maintain direction without standing a few inches from your shoulder but instead several feet. Your whip is the extension of your arm and becomes the motivator and forward impulsion to encourage the horse to move ahead. It is an integral part of your training tools that should always be present and used. How you hold and position the whip will ultimately determine the success of your training sessions. Once the horse has mastered walking a circle unaided, you will begin to assume the position that will benefit your communicating abilities most effectively. Consider that your hand close to the horse’s head directs the forward motion and the hand holding the whip is responsible for the impulsion from behind. That leaves the trainer’s body that is then aligned with the corresponding body of the horse. This creates a perfect “V” which now becomes the anchor point for the lounging exercise. This anchor point is lost when the trainer begins to chase the horse rather than direct the horse. If you happen to be one of these individuals, an easy cure for this “chase the horse” syndrome, is to place a square of cardboard or plywood approximately two feet square on the ground and use it as a marker point. Stand on this base and remain on it while working the horse. It will force you to use your whip more effectively, and correct body position. When a person falls out of the “V” position and moves forward towards the shoulder area of the horse, it impedes motion and the horse breaks gait, slows, stops or even turns in. The horse responds appropriately to the position as if a person was leading it. A horse is taught to walk and stay beside us, rather than pushing ahead and is usually reprimanded for bullying its way along as it becomes strong on the lead. Stalling on the lounge line is not necessarily a case of laziness on the horse’s part. Rather, it may be the result of lost or diminished impulsion from the person on the end of the line who is responsible for engaging the horse. Body language is critical. It can be supple or aggressive, depending on the urgency and response to command. Since hearing is known to be the keenest natural sense of the horse, voice instruction, or more importantly, tone of voice, is a highly effective tool. The vocalization should reflect the nature of the command intended. For instance, the command to “walk on” should be strong and upbeat. The command “trot” should be quick and short as the gait implies and so on. The transitions down to a walk should be similarly slower and softer in tone. The command to halt or “whoa” should be strong and abrupt. This command is singularly the most important voice command your horse should learn. Having brakes during flight responsive situations can avert disaster. In coordination with your voice commands, the placement and direction of the whip reinforces the spoken word. Transitions up should be accompanied with an elevation in whip. Conversely, transitions down require lowering of the whip until the lash rests on the ground when the final command to halt is given. Ineffectiveness of normal voice and whip commands requires increased body language to correct and improve performance on the part of the horse. A horse that gradually or constantly cuts in, requires the whip placement to be directed towards the shoulder. Most horses are predictable with this behaviour, often choosing the identical location to turn into the circle at each revolution. Preparing for this inevitability and placing your whip before the horse begins to cut, should correct the problem. The horse must respect the arm of the whip and stay on the circle. A horse that lugs and is lazy in its response to commands can benefit from increased drive. To accomplish this, the trainer must first shorten their line in the lead hand and move their shoulder of the whip hand forward and inward to the horse’s hindquarters. Constant cracking of the whip does nothing to induce a faster pace with a slow mover on the line. It is not only annoying to everyone; it is without merit or substance as a training tool. The horse quickly learns to tune the noise out, much like a person turning a deaf ear to repeated nagging. A good trainer will observe its pupil and make necessary adjustments to the exercise program. Watch how the horse carries its head and frame. A nose tipped to the outside is a horse that is not focused. It can also pull out and reverse. The lounging horse should carry its nose straight or slightly to the inside. The line should move freely in and out, like trolling with a fishing line. A stubborn line that is fixed and unforgiving creates heaviness in the horse. Short quick tugs on the line will help refocus the horse’s attention. Changes of direction can be accomplished in various fashions. All reverses should start from a halt on the circle. The trainer can direct the horse by body signals or walk to the other side of the horse and then ask the horse to move off in the opposite direction. The trainer should lower its whip to the ground and pass it under the lunge line to the other hand while changing line hands. A whip whose lash is flinging in the air will disturb the horse. Should the horse move when walking to the other side, stop, reaffirm the “whoa” command, and then continue to take up position on the other side of the horse. Having the horse face you and walk towards you can lead to a vice. Horses can quickly deduct from the habit of walking towards the trainer, that they are in control of the situation. If you allow this practice to continue, you may have difficulty directing your horse back onto the circle. The horse will quickly learn that if it turns it, the lesson is interrupted. Once your student has acquired basic position and voice commands, you can build on your instruction. 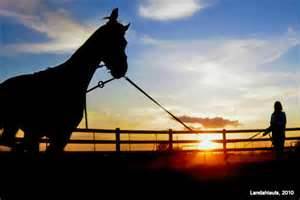 The horse can learn to lengthen its stride, relax its gait, flex and obey the trainer’s commands. A horse well versed on the lounge line will work at ease for its trainer and carry out the commands explicitly to the letter. The working horse on the line should be able to halt within two strides from a trot on the line, simply responding to the voice command. It should be able to reverse on command with little direction. The ultimate test for the lounging horse is to have it work at liberty, solely from the direction of voice command. You will then have accomplished the art of lounging.